A theme which I hope to pursue in multiple posts on this blog is that even if one is interested mainly in complex dynamics, it is often useful to employ p-adic (or more generally non-Archimedean) methods. There are a number of relatively recent research papers which illustrate and support this thesis. The one I want to talk about today is this beautiful paper of Benedetto, Ingram, Jones, and Levy, henceforth referred to as [BIJL]. Theorem 1: For any fixed integers d ≥ 2 and B ≥ 1, there are only finitely many conjugacy classes of post-critically finite rational maps of degree d which can be defined over a number field of degree at most B, except (when d is a perfect square) for the infinite family of flexible Lattès maps. I want to explain a beautiful proof of the Law of Quadratic Reciprocity from c. 1874 due to Egor Ivanovich Zolotarev (1847-1878). Some time ago I reformulated Zolotarev’s argument (as presented here) in terms of dealing cards and I posted a little note about it on my web page. After reading my write-up (which was unfortunately opaque in a couple of spots), Jerry Shurman was inspired to rework the argument and he came up with this elegant formulation which I think may be a “proof from the book”. The following exposition is my own take on Jerry’s argument. The proof requires some basic facts about permutations, all of which are proved in this handout. 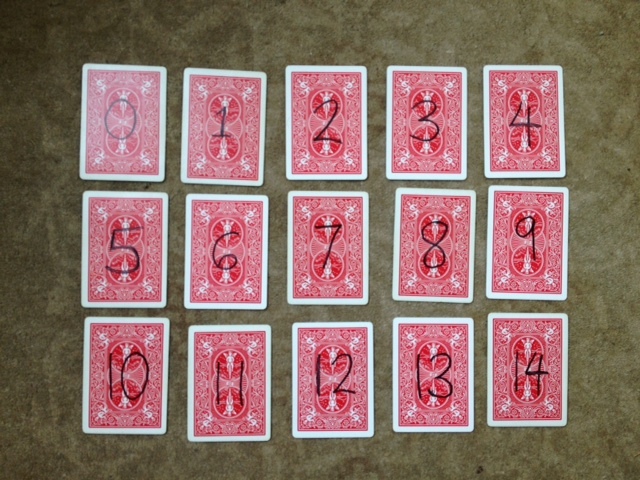 Row deal ( ) : Deal the cards into rows, going left to right and top to bottom.